(Photo courtesy of Frank Brown) Frank Brown standing by his work, The Second Coming of the William Lynch Theory, created in 2008. It is on display in the atrium of the Lowertown Lofts Artist Cooperative in downtown St. Paul. Brown has had many noteworthy positive responses going back quite a few years, the latest of which is a commission to create a sculpture for the Abraham Lincoln Library and Museum in Springfield, Illinois. Brown says the piece will be of five individuals: Abraham Lincoln, Sojourner Truth, William Garrison, Harriet Beecher Stowe and Frederick Douglass. The piece should be done some time in the next 14 or 15 months, Brown thinks, and follows on the heels of the Ramsey County Historical Society accepting three other sculptures of Brown’s. Those three sculptures are what remain of an eight-piece music combo playing. Five of those figures have sold; the remaining three — an African American playing a trumpet, one on drums, and the third playing piano — were chosen for display at the Historical Society after being housed at the St. Paul Foundation. Originally from Carbondale, Illinois, Brown relocated to Springfield with his family at the age of 13. 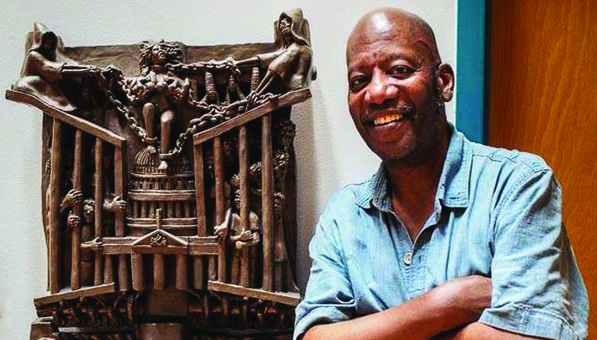 While in Southeast High School, Brown created what he calls his “first public art piece” and helped create the school’s mascot. Brown is known as a social commentary artist and has been an invited lecturer at places like Saint Thomas and Macalester universities. But while things are looking up for Brown, that has not always been the case. Earlier this year, Brown was on the edge of leaving St. Paul after two particularly exasperating and infuriating incidents. But shortly thereafter, Brown said, “I received a phone call saying the company decided to discontinue the contract. I cried for about two days, felt sorry for myself for about two weeks, then I got angry and got a lawyer, and I found out that they fired me because of my physical disabilities — which they were already aware of.” Brown was born with multiple disabilities, which he also refers to as “birth challenges.” Among those “challenges” was being born without biceps or kneecaps. “They said they were letting me go because of my disabilities, but also that several employees said they refused to work with a Black man. I think that was the main reason. It had nothing to do with my disability. The police then, Brown says, picked him up by his arms and ankles, aggravating his disability to the point where he required surgery. “I’m getting ready to go through with a lawsuit against the City of St. Paul,” Brown told us. But the incident led to Brown deciding against leaving town. “At that point, I decided I was never going to leave St. Paul,” Brown said, or the studio he owns in Lowertown. “What motivated me to stay is that I refuse to let racism push me left or right. I would not let racism guide how I live. I stand my ground. Only one thing can make me move, and that’s the will of God. “There is always going to be what I call ‘t and t’ in life: trial and tribulation. Negative and positive things happen. You can stay focused on the positive things in life, and those things will come about. Isaac Peterson welcomes reader responses to ipeterson@spokesman-recorder.com.